Vitamin B12 is required for energy production and nervous system function as it’s used to produce myelin, a fatty sheath that surrounds and protects nerves. In a recent study, subjects taking methylcobalamin experience improved sleep quality and increased daytime alertness and concentration, and in some cases they also reported improved mood. Much of the benefit appears to be a result of methylcobalamin influence on melatonin secretion and resetting the biological clock. Specifically, methylcobalamin causes a significant decrease in daytime melatonin levels while increasing nighttime levels. 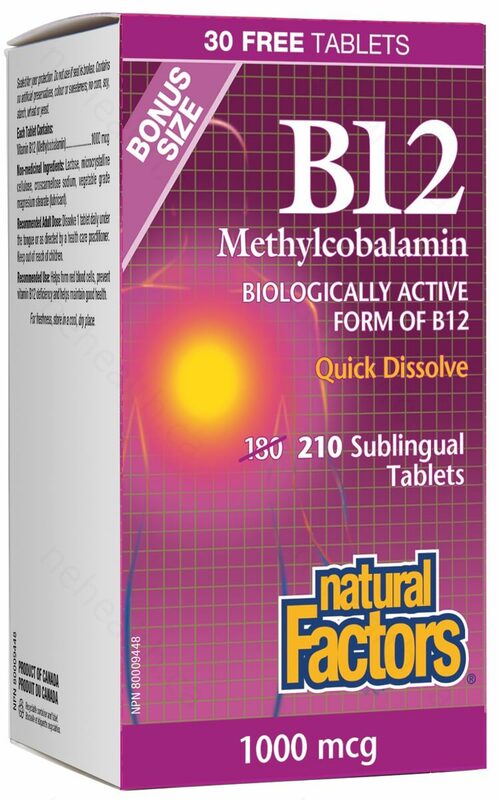 What are the key benefits of supplementing B12 Methylcobalamin? Easy to take and easily absorbed! B12 1000 mcg Methylcobalamin is the most active form of B12; effective in brain and nerve function, treating sleep-wake disorders and improves daytime alertness. 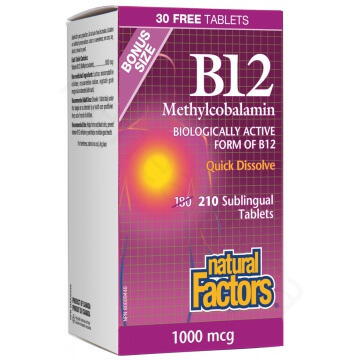 B12 1000 mcg Methylcobalamin is the most active form of vitamin B12; effective in supporting brain and nerve function, it helps treat sleep-wake disorders and improves daytime alertness. The most active form of B12; effective in brain and nerve function, treating sleep-wake disorders and improves daytime alertness. How Does B12 Support Energy, Mood, Memory, and Heart? Low energy, pale skin, chronic fatigue, constipation, depression, digestive disorders, dizziness, drowsiness, difficulty sleeping and many other symptoms can indicate a B12 deficiency. In 1948, vitamin B12, or cobalamin, was identified as the nutritional factor that prevented pernicious anemia, a deadly disease of the red blood cells. B12 is needed for formation of myelin, the protective covering for all nerve endings, and for production of acetylcholine, a neurotransmitter that supports memory and learning. This important nutrient also helps form the body’s genetic material (DNA and RNA), and participates in cellular metabolism. With folate and B6, vitamin B12 helps reduce levels of homocysteine, a substance linked to heart disease risk. The body needs small amounts of this nutrient, regularly. Historically it was difficult to cure anemia with B12 supplements because the nutrient couldn’t make it through the harsh environment of the GI tract. B12 injections have since been used effectively to treat anemia and increase energy. However, studies have shown that sublingual absorption of B12 improves bioavailability and speeds the body’s metabolism of these nutrients, providing an alternative to injections. There are some plant sources of B12, but the richest food sources are meat, eggs and dairy products. Vegetarians, vegans and children who don’t eat these foods, can have deficiencies of this nutrient. Seniors or anyone having difficulty with mood, nerves or sleep can benefit from B12 supplementation. Studies indicate a B12 deficiency doubles the risk of depression, and B12 may also help prevent Alzheimer’s and other forms of dementia. High doses of B12, administered under strict supervision, have produced good results in the treatment of sleep-wake disorders. Low levels of melatonin in the elderly may be related to low B12 status and supplementation may improve sleep quality, daytime alertness and concentration, while enhancing mood. Dissolve 1 tablet daily under the tongue or as directed by a health care practitioner. For advanced neurological disorders, such as MS, Bell’s palsy, diabetic neuropathy, and Alzheimer’s, take 5,000 mcg daily. Persons with any severe neurological condition should work closely with their health care practitioner.